Summary: Rising sophomore Travis and his best friend, Creature, spend a summer in a Eugene, Oregon, trailer park dealing with cancer, basketball, first love, addiction, gang violence, and a reptilian infestation. I first bought this book at The Strand because the excerpt looked funny and seemed like a worthwhile read. Now, however, I don't really know how I feel. After finishing this book, I'm just left with a general, overall feeling of "meh." I didn't understand the point of the plot, or where the story was supposed to go, or anything. Alright, that was a totally disorganized stream of consciousness right there, so I'll try to make it a little more organized. I'll start with the aspects of this book that I liked. I liked that one of the overall themes was like everybody has complex life struggles, as Travis seems to have so many. He was homeless for awhile, has a drug-addict mother, a grandpa taking painkillers not prescribed to him, a grandma with cancer, living in a rundown trailer park, got kicked out of his basketball league when that was his one passion, etc. He had a lot of hardships and the story was good at demonstrating. I liked the aspect of Travis's character where he cared about the homeless, especially his mother -- proving that he has an element of forgiveness. Even though his mother was a woman who cared more about drugs than him, and who had her son sleep in dumpsters and outside and in creepy motel rooms because she was more concerned about getting her next fix than her own son, Travis still biked around the homeless camps every weekend with food and money for his mother, and when he couldn't find her, he gave it to others. Even though his mother wronged him time and time again, he was always working to get money to give to her to start a new life, always searching for her, always trying to help her. I enjoyed that aspect of the story. However, the biggest part of the story that I didn't enjoy was that I just didn't get it. I don't know where the story is supposed to be going. The summary of the book on Goodreads should be evidence enough -- there's barely anything described. It's like the story has no plot. It has a message about drug addiction and having a difficult life, but there really seemed to be no story line. (Brief spoilers ahead, please skip to the next paragraph if you haven't read the book yet!) There were just too many loose ends at the end of the story. Why did Creature die so suddenly? What ends up happening with Travis and Natalie? With his grandma? With the basketball team? With the crocodiles in the lake? When I finished the story, I sat back for a second and tried to make sense of it. But I couldn't figure out what really even happened, because so much of the story was left unanswered. Too many loose ends, which I really didn't like. The one other aspect of this book that bothered me greatly was that I definitely got an overwhelmingly sexist vibe. Whether this was the author's personal beliefs or just Travis's I don't know, so I'm not going to comment on that. But when Travis meets Natalie, the majority of what he notices about her is her bra straps, or her chest, or her tan legs, or her tight clothes, or her little bikini. Just about every time Natalie is mentioned in the books, her physical characteristics are mentioned first. And they're always comments about her chest or her legs or the tight clothes she was wearing. By the last few chapters of the book, I was getting mildly disgusted at the piggish vibe I was getting from Travis. And I really, really didn't like that at all. It was a major turnoff that made me not like the book that much more. 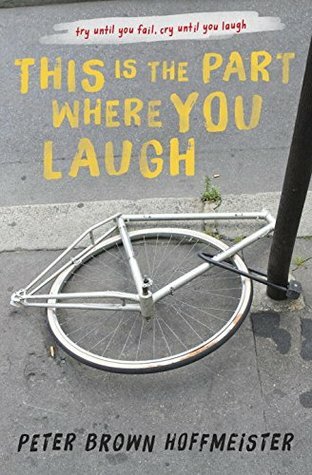 Overall, This Is The Part Where You Laugh was an okay book. It was an easy read and there were some parts that were really funny, but overall, the story didn't make much sense to me and I felt like too much was left unanswered in the end, which was another turn off. However, that may have just been how I read and interpreted the book, so if you had this book on your TBR, I still encourage you to give it a try. Who knows? You may end up liking this story better than I did. I'd still be open to reading another story by Peter Brown Hoffmeister in the future, because every story is different, and hopefully some of his others may make more sense to me.